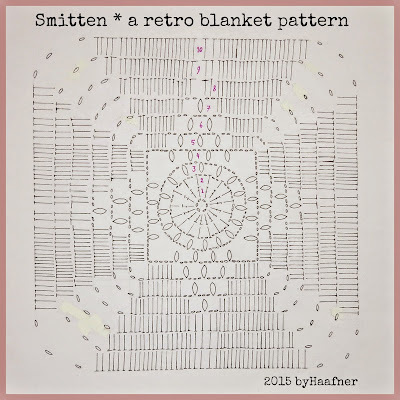 ByHaafner * crochet : Smitten. The pattern. 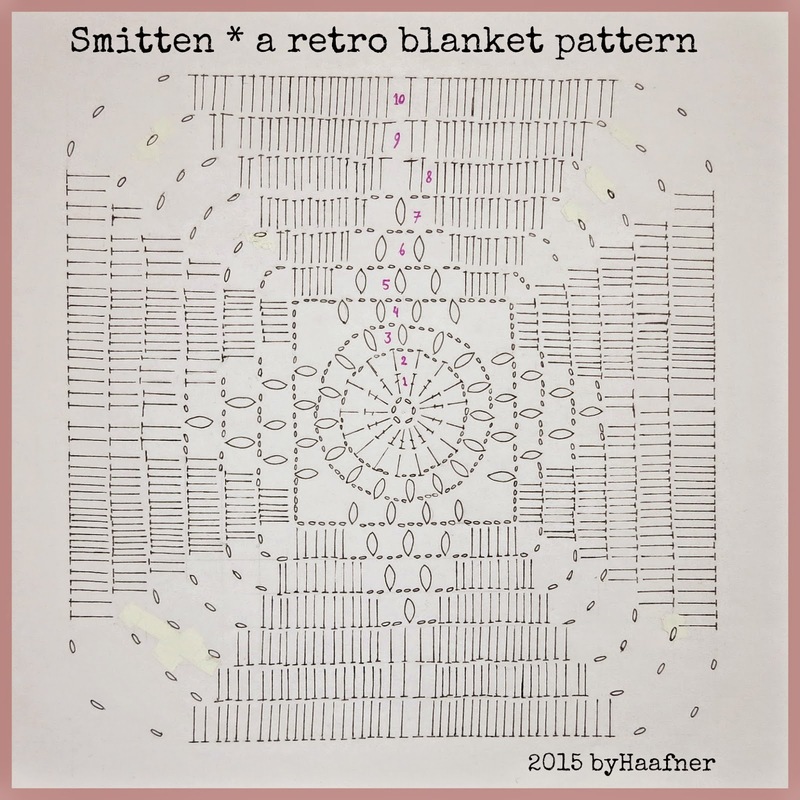 Wow, I was blown away by your kind comments on the Smitten Blanket. Many thanks! Please note that to the best of my knowledge this is a very old, vintage pattern. I re-created it from a blanket I fell in love with. However, if a original pattern is somewhere to be found, please let me know and I will of course give credit where it's due! Kudo's to the original designer of this lovely pattern. 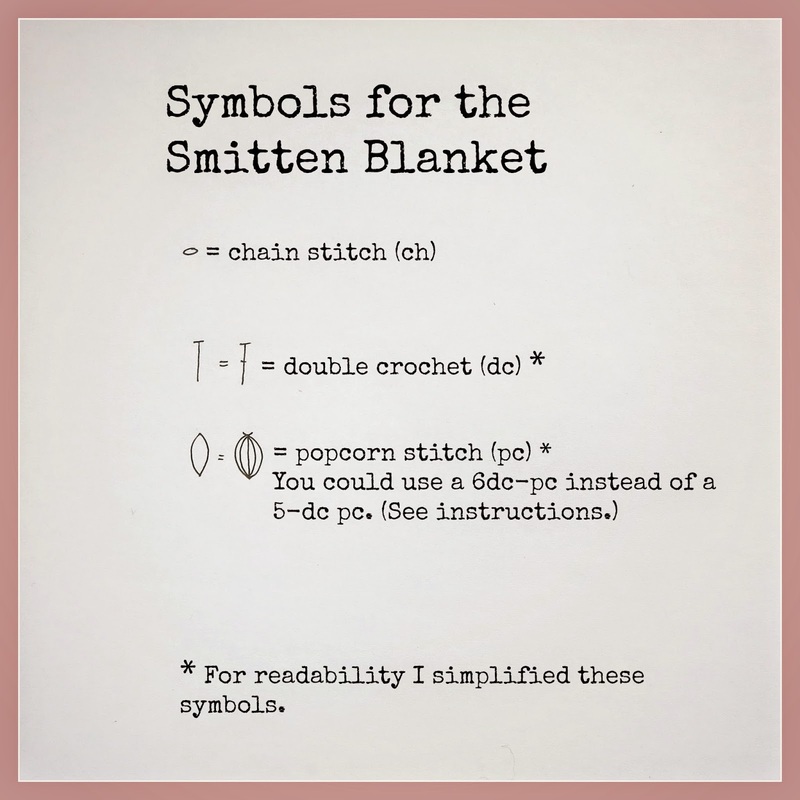 ♦ If you have not worked a popcorn stitch before I can recommend Youtube for some excellent tutorials. ♦ I used a 5.5 mm crochet hook. This resulted in a blocked square of 34 x 34 cm. ♦ One square eats (very) roughly about 120 mtr yarn. ♦ Please note that in round 8 you do not want to make a dc on top of the popcorn from round 7. You'll need a little gap there - it is like the top of a little gap-staircase started in round 5, if you know what I mean ;-). ♦ Instructions between * * are repeated as many times as the patterns calls for. ♦ If you're using the chart as reference: I did not mark the first stitch of a round specifically as such. PLEASE do NOT share this pattern or chart elsewhere (like blog, facebook or instagram, snapchat, youtube, ravelry... et cetera!) but link to this page instead. And - obviously - it's not allowed to sell it on etsy etc. Thanks for your understanding. chain 6, close in first chain to form a ring. Alternatively, make a magic circle. Close this round with a slip stitch of by using a blunt needle. Make a standing dc (alternatively: chain 2) in any dc of the previous round, 1 dc in each dc of the previous round. In the corners: 2dc in ch3-space, ch3, 2 dc in same space. Continue with 1 dc in each dc of the previous round. All the way round. Close the round. For my sample blanket I slipstitched the squares together. Hold the squares together (front sides facing eachother) and slipstitch through the outer loops. Easy peasy! After that, I gave my sample blanket a simple edging of two rounds of dc. Wow - that was it, I guess. Your blanket is ready! Please leave a comment if you detect a mistake or if something is not clear and I will do my best to help. I do hope you have as much fun with this pattern as I had. 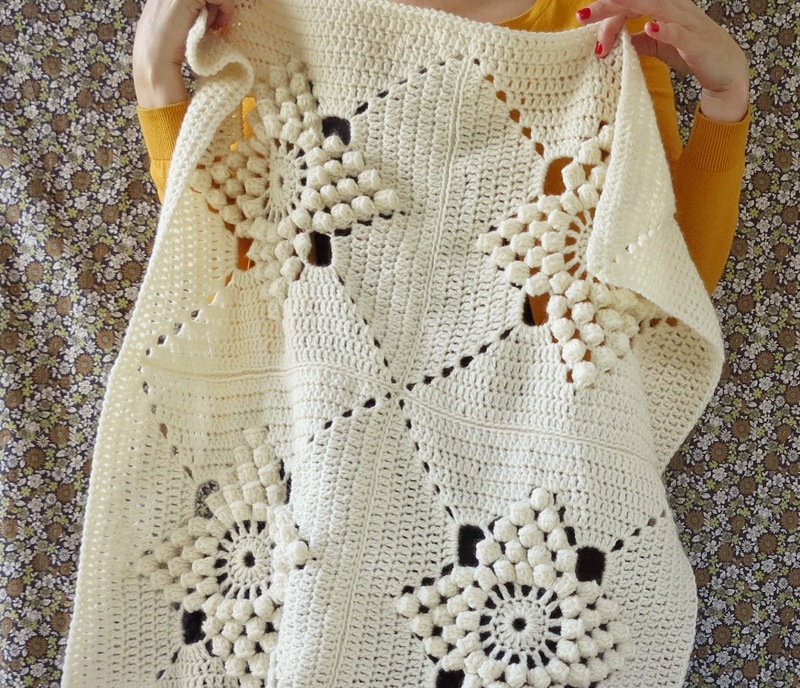 Oh, and if you are making this blanket, I'd loooove to see the result! Thanks for your kind visit. Much appreciated! Happy crocheting and have a lovely weekend. 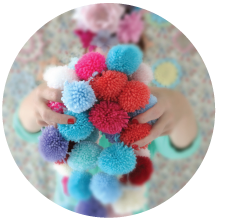 Am enjoying reading your fab blog, looking forwards to more of your beautiful creations. Wat een mooi patroon om te maken. Ik gebruik stonewashed blue. prima beschreven en het haakt zo gemakkelijk. Hartelijk dank. So beautiful! And thank you for the pattern! Great! I'd love to see your blanket when it's finished! I'm sure your daughter in law will be very happy with your present. It came out beautifully, Haafner. 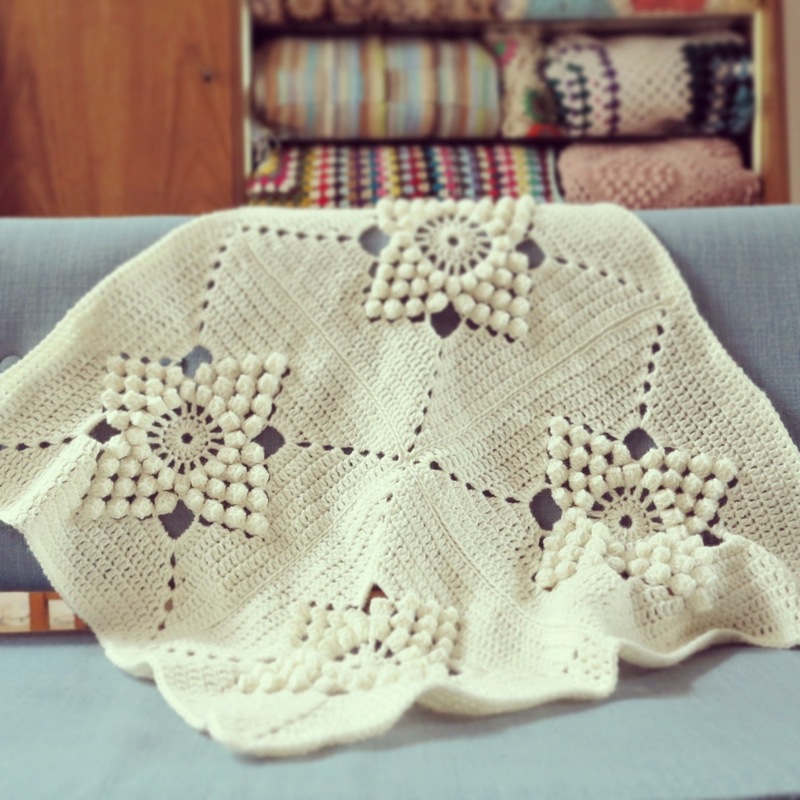 Thank you for this gorgeous pattern! OH MY WORD, I shall HAVE to try this! What have you done to me? Naughty you for making me add yet another 'must make' to my list! he he! I really shouldn't...but.......oh.....oh...there you go......you've twisted my arm. Oh go on then........! Tis' most lovely of you to have taken the time to write out the pattern, and (wowzers), do a chart too, for us non written lovers!!!!! 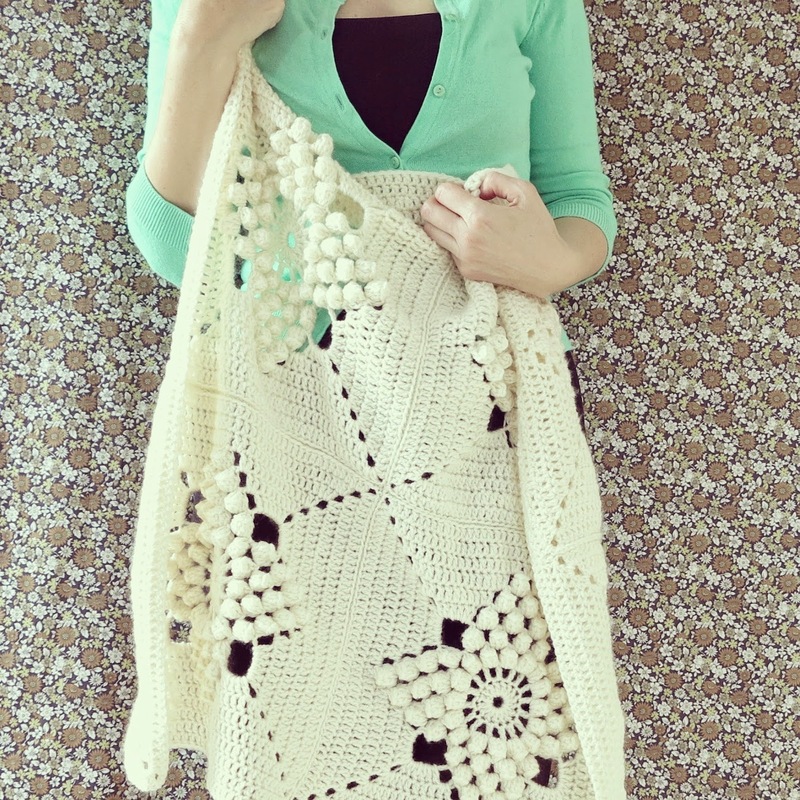 It takes a huge anmount of effort and I'm so sure that it will be well appreciated by all us crochet lovers! :-) Haha, thanks - that made me laugh... I'm happy you like the pattern! Beautiful! Many thanks for the pattern. what yarn did you use? A Dutch acrylic brand, I'm afraid it's not available abroad. yippee, yippee ay yay! Wat een werk heb je verricht door een patroon én chart te maken. Diepe buiging. Ik ga meteen op jacht naar geschikt garen en stort me dan gelijk op je patroon. Dank je en een heel fijn weekend. Thank you! It's a great pattern, I love it! My pleasure, thanks for your kind comment! Thanks for this great pattern!!!!!! Graag gedaan! Fijn dat je er blij mee bent! Wow! 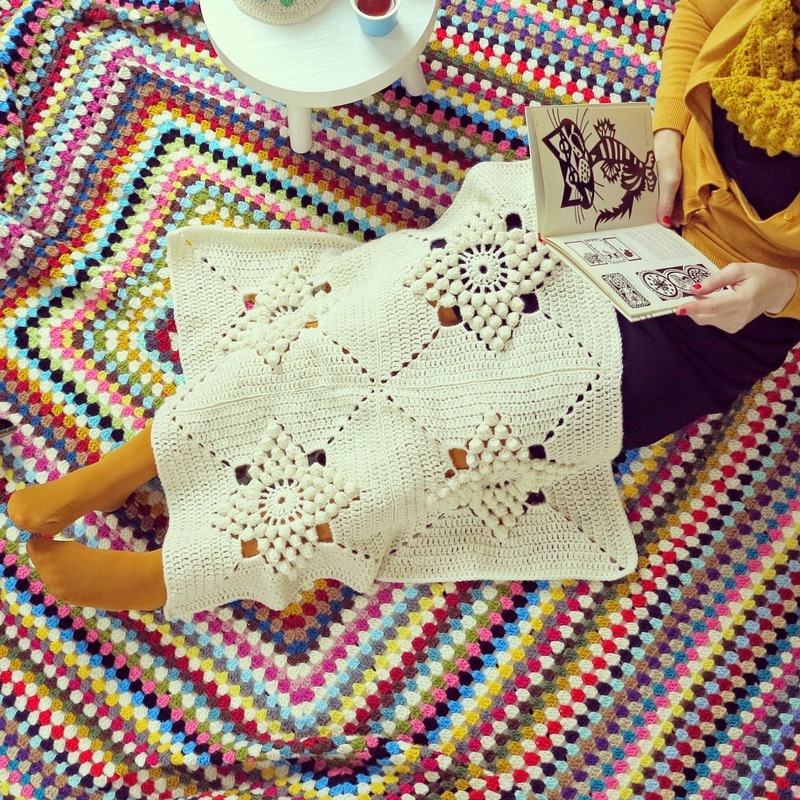 Not only is this blanket GORGEOUS, that chart looks GREAT! Lots of time has been put ito this and the results are fantastic. Thanks for your very kind words! That's very sweet of you. I will check your link party out for sure. Bonsoir, hier j'ai découvert ce magnifique blog que j'ai ajouté à mes favoris. Je suis tout de suite tombée amoureuse de cette superbe couverture en me disant : il me la faut. Aujourd'hui j'ai commencé mon premier carré et je l'adore!!!! c'est un super travail, votre blog a été ajouté à mes favoris. Thanks so much! Merci! Have a lovely day! Bonjour, j'ai maintenant 16 carrés crochetés avec du 4 et une laine blanche de mon stock. J'aimerai aller jusqu' à 25. Affaire à suivre. a bientôt. Christine. Merci beaucoup! I'd love to see your blanket. Have fun crocheting! Thanks for the pattern! I started three weeks ago and just finished a beautiful blanket! Happy with the results. I changed a bit of the pattern, the square is more flat now I suppose. I will try to post a picture!!! Oh, yes please, I'd love to see your blanket! Thanks for your message and have a lovely day! My pleasure! Thank you Debbie, for your kind words! Thank you so much for all the work you have done to share this pattern. I am really hoping to get to grips with charts so written instruction in addition to the actual chart is a godsend, helps so much in confirming what you are doing is correct. The trick is where to stick the hook, obvious if you know?? Thank YOU for your sweet comment - much much appreciated! Your Blanket is so beautiful. Thanks so much for taking the time to write out and post the pattern for us. Your so kind. I'm new to crochet and have learned there is a UK and US double crochet. I'm guessing this is US, am I correct?? I can't wait to make this. I love your blog too!! Many thanks for your kind comment. I'm happy you like the blanket and the blog! Yes, I've used US terminology (everywhere on my blog). Hi Conny - My pleasure! When I saw your post I fell in love straight away. I made this blanket on a double bed size for my brother in law and wife. It is so enjoyable and the result is so beautiful. Ooh I love this pattern just like your other popcorn square pattern. Thank you very much for sharing! I wanted to say a very big thank you to u for sharing this pattern with us all! I'm totally smitten! This has to be the most beautiful blanket ever! Defo gona be my next project! Hello from Brasil, I just stared this pattern. thank you so much sharing this beautiful blanket!!! I made a popcorn quilt about 40 years ago from a pattern in a magazine - possibly Australian Woman's Day. First of all I must say this is an absolute love-at-first-sight kinda pattern... Thank you so very much for sharing this pattern. Very nicely explained instructions. I have used this pattern for cushion covers in solid color. Everybody loved them. All images and texts on this blog are mine and copyright protected – unless stated otherwise. If you like what you see here (hooray!) and you wish to post any of my material on your blog or website - please ask me first: haafner [at] hotmail [dot] com. Thank you. © byHaafner. Powered by Blogger.